On Tuesday Apple reported record revenue of $26.741 billion for the company's 1st fiscal quarter ended on December 25, 2010, representing 70.5% growth in revenue over the prior-year period and a 31.5% rise in revenue sequentially over the fiscal quarter that ended in late September. This frenetic pace of revenue growth was fueled by strong growth in iPhone sales and the emergence of the Apple iPad in the company's product line-up. The graph below illustrates the percentage contribution to revenue from each of Apple's largest revenue segments. Combined, the Apple iPhone and the Apple iPad represented 56.38% of Apple's reported revenue. 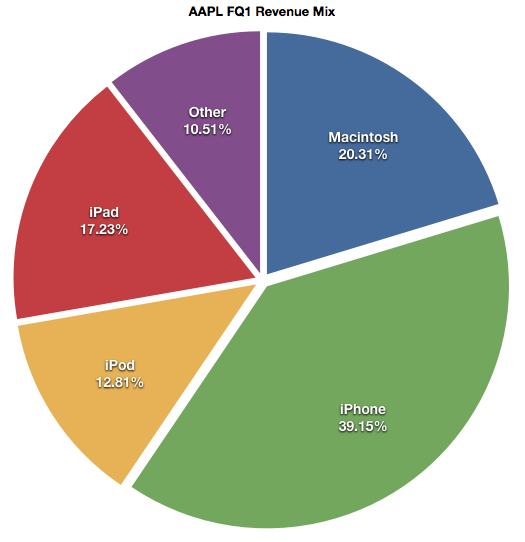 The Macintosh line of personal computers contributed just over 20% to the revenue total and the Apple iPod line represented just over 1/8th of the total at 12.81%. But there's much more that's revealed in the first fiscal quarter's revenue numbers. The table date above reveals that the Apple iPhone and iPad represented almost 86% of the $11.058 billion increase in revenue over the prior-year period. Although the Apple iPad had no sales activity in the prior-year period and consequently 100% of the iPad's revenue total in the quarter contributed to the 70.5% growth in revenue, the rise in iPhone revenue year-over-year eclipsed the iPad's revenue total. 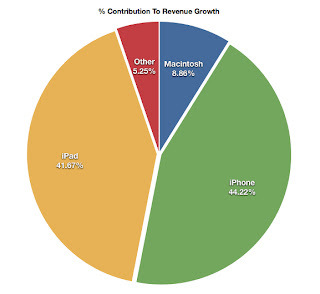 In other words, the growth in iPhone revenue exceeded the entire revenue contribution from iPad sales. The graph below illustrates the contribution to revenue growth from each of the company's larger revenue segments. For purposes of this graph, the .031% contribution of the Apple iPod line to revenue growth has been grouped in the "other" category. There's no disputing the fact the Apple iPad has quickly become a major revenue source for Apple or that the Apple iPad is now an integral component of Apple's continuing success. But what the first fiscal quarter revenue data also reveals is that absent the revenue contribution from the Apple iPad in the company's first fiscal quarter, all other revenue segments grew revenue by a combined 41.13% or $6.45 billion, lead primarily by the strong revenue performance of the Apple iPhone as well as the ongoing revenue growth generated by the Macintosh line of personal computers. This pace of more than 40% revenue growth from product lines that have been in the market for well over one year indicates that while the iPad contributed significantly to Apple's 70.5% revenue growth in the December quarter and the company's 66.7% revenue growth in the September quarter, the pace of revenue growth in the December quarter from revenue segments other than the iPad kept pace with the 40.5% pace of revenue growth from these products lines in Apple's most recent fiscal year ended in September. This suggests Apple can maintain revenue growth in the range of 70% this fiscal year and with the broadening of the revenue base through the release of the Apple iPad, Apple can maintain revenue growth of 50% or more through next fiscal year as well. In other words, Apple is on track to not only surpass $100 billion in revenue in Fiscal year 2011 ending in September, with the broadening of the revenue base from the release of the Apple iPad, the company may surpass $150 billion in revenue the following fiscal year ending in September 2012. Based on Apple's rates of continuing revenue growth and the broadening of the revenue base achieved through the release of the Apple iPad, I expect earnings per share this fiscal year to meet or exceed $25 and forecast FY 2012 earnings to meet or exceed $37 per share. In the December quarter 22.5% of Apple's reported revenue flowed to the net income line, slightly above the recent four quarter average. As revenue continues to rise quickly, the rate of earnings growth should continue to keep pace. Wow! When I invested in APPL in '06, annual revenue that year was $5bn, to have imagined it would become $100bn in 5 years is incredible. I hope that in my lifetime I get to see Apple become the first trillion dollar revenue company. Now that would be something.